Late Activities. It will get dark earlier now. Make sure you child has a safe way home after it gets dark. Consider picking them up or make other arrangements. Reflective Clothing. If your teenager needs to walk at night or be near traffic, consider purchasing reflective clothing to keep at home. Many backpacks and sneakers have reflectors–look for products like that. Ask Your Children to Put Away Their Cell Phone. When students are distracted, they may not be able to respond to drivers who are not using caution. Safe Kids Worldwide, a non-profit organization, recently reported that it observed 34,000 children crossing the street near 68 U.S. schools. Of these, one in five high school students were distracted by an electronic device. The rate was one in eight among middle school students. The numbers are significant because pedestrian accidents involving teens age 16-19 have increased 25 percent over the past five years, Safe Kids Worldwide reports. This age group now accounts for about half of all pedestrian accidents among youth. School Buses. At the beginning of the year, stand out at the bus stop with your children. Explain to them the appropriate areas to stand while waiting and how to board the bus. Finally, parents if you are driving, commit to putting away your cell phone. Texting while driving is against the law in Massachusetts and that includes viewing texts, e-mails or browsing the Internet. Drivers need to eliminate distractions, especially when children are in the car, and especially in busy drop-off areas at schools, because car accidents can occur. This time of year, bus drivers and other parents who are driving are still getting used to their new routine and may not use proper caution when stopping or turning. Also avoid using your cell phone while parked outside of schools or at bus stops waiting for your children – even just to make phone calls. An accident can happen in the instant you let your guard down and reach for your cell phone to view a text message or check in on a social media account. If you have a teenager who drives, remind them not to use their cell phone while driving (this is the law in Massachusetts for junior operators). You have probably done so in the past, but explain the school parking lot is busy and there is no room for distracted driving. If they want to use their cell phone in a parking lot, suggest they park the car, get out and walk off the pavement first. The Boston car accident lawyers at Breakstone, White & Gluck have over 100 years combined experience handling injury cases in Massachusetts. 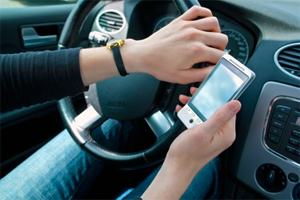 We have handled cases involving driver negligence due to cell phone use and distracted driving. We handle cases throughout Massachusetts, including in Boston, Cambridge, Lowell, Worcester, Framingham, Brockton and Plymouth. For a free legal consultation, contact us at 800-379-1244 or 617-723-7676 or use our contact form.